Visiting US Defence Secretary Leon Panetta is expected to ask India to increase its engagement in Afghanistan to bring about peace there, especially after 2014 when the international forces start to withdraw from the country. 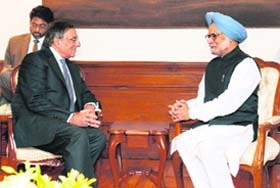 US Secretary of Defence Leon Panetta (L) with Prime Minister Manmohan Singh in New Delhi. The Joint Parliamentary Committee probing the 2G spectrum scam may not ask Home Minister P Chidambaram and former Telecom Minister A Raja to appear before it. The JPC held its 39th meeting and questioned former TRAI chairman Nripendra Mishra. It was essentially meant to be an exercise to authorise party president Sonia Gandhi to nominate the candidate for the presidential and vice-presidential elections, but the Congress chose to utilise the opportunity to hear the voices within over issues that have been troubling the party rank and file since the recent electoral setbacks. Tuesday came with two good things on the World Environment Day: the southwest monsoon is on course. And as if on a cue, light showers greeted large parts of north India, as a happy precursor to the good news from the India Meteorological Department (IMD). The government today appointed Vice Admiral DK Joshi, as the next Chief of the Indian Navy to replace Admiral Nirmal Verma. He will take over on August 31. In the intervening period of three months all important files and decisions will be taken with he being in the loop. June 6, 1984, the day the Army launched an attack (Operation Bluestar) on the Golden Temple. It has been 28 years. Why then has the SAD-led Government, into its third term, allowed a 'Blue Star Memorial' in the Golden Temple Complex to come up? The government has finally woken up to the needs of fast increasing �census towns� with the Planning Commission allocating Rs 1,500 crore (subject to final approval) in the 12th Plan for infrastructure development in 50 or 60 urbanised villages across the country. 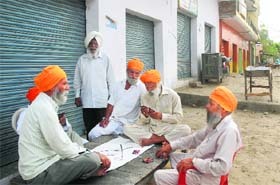 Villagers at a market at Fatehgarh Sikri village near Begowal in Kapurthala.